Luxury Hand-picked Villas in Crete. We’ve selected our luxury villas to suit your travel style. Exclusive concierge services 24/7 at your service, covering your every desire. Luxury Villa in Crete. Black Pearl Villa is the absolute in luxury and relaxation combining traditional and modern materials. Luxury Villa in Crete. White Pearl Villa offers a total comfort in sophisticated minimalist style. The finest villa for your luxury holidays. 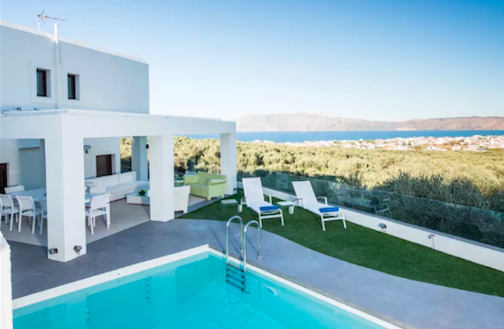 Luxury Villa in Crete, Villa Argo consists of two separate floor apartments, (1/2 hour from Chania) and sleeps up to 10 guests in its 5 bedrooms. Unique Lifestyle Mangement Services, Party and Event Planning, Private Chef Service, Personal Security Services. 24/7 at your disposal covering all your needs. Exclusive and Personal Concierge Services in Crete. Your personal concierge will take care of everything for you while you make the most of your time. Whether you're looking for a private chef, luxury catering or a private dinner our chefs brings the restaurant experience to your villa or yacht, making your event more exclusive and private. Luxurious Wellbeing, Personal Trainers, Aerial Yoga, offering unique classes. Every spa and wellness escape is perfectly-suited to satisfy all your vacation relaxation desires. Experienced private drivers, chauffeur and limousine services in Crete, Greece. Helicopter charter, Motor Boat and Yacht Charter, Luxury Car Rental Service. Have a luxury ride from a chauffeur driven car in and around Crete. Chauffeur driven car hire services for airport, wedding, events, excursions. Leisure or Sport And Adventure Activities. From anything to everything, jet skiing, eco tourism, mountain biking, mountain climbing, rafting, diving, tennis, sailing, wind-surfing etc. Fishing villages, gorges, private rocky bays with crystal clear water gives you total harmony because most of the places are isolated and totally untouched. Sailing in Crete, an amazing experience.